Two Palestinian protesters were killed by Israeli soldiers at approximately 17:00 on Tuesday, 18 September 2018. 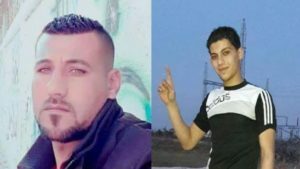 The two young men were identified as Mohammad Ahmad Mohammed Abu Naji (32) from Beit Lahia Housing Project who was hit with a bullet to the chest; and Ahmad Mohammad Muhsen ‘Omer (24) from al-Shati’ refugee camp who was hit with a bullet to the chest. Both of them were taken to the Indonesian Hospital in Jabalia. Israeli forces stationed at the Beit Hanoun “Erez” Crossing in the northern Gaza Strip fired live bullets and tear gas canisters to disperse hundreds of civilians who were protesting near the crossing, following a call from the National Committee of March for Return and Breaking the Siege to participate in the “Together for the Rights of Refugees and Breaking the Siege” activity. 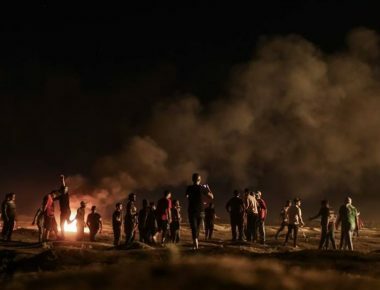 Israeli soldiers shot, on Tuesday afternoon, two young Palestinian men near the Beit Hanoun (Erez) terminal, in the northern part of the besieged Gaza Strip, during a nonviolent procession organized by the Higher National Committee to Break the Siege on the coastal region. The soldiers started firing live rounds at the protesters, wounding two Palestinians, before Palestinian Red Crescent medics rushed them to the Indonesian Hospital, in Beit Lahia, in the northern part of the Gaza Strip. Media sources in Gaza said thousands of Palestinians participated in the procession, many of them were transported by buses, and started waving flags and chanting against the ongoing illegal Israeli siege on Gaza, and the escalating Israeli violations against the civilians. The soldiers fired a barrage of high-velocity gas bombs, and concussion grenades at them, in addition to many rounds of live ammunition. Also on Tuesday, the Palestinian Center for Human Rights (PCHR) issued a statement denouncing the ongoing and escalating excessive Israeli military use of force against the Palestinians, leading to the death of four young men, including one child, in less than 24 hours, in two separate attacks in the northern and southern parts of the Gaza Strip.